The time has come you guys. I never thought I’d see the day, but lately my kitchen is getting more action from real meals than desserts…I knew that with a growing boy with a big appetite I’d have to start cooking real food soon, but I have to say it’s really crept up on me. I am the mother to a one year old boy who prefers spicy Mexican, Thai & Indian food over anything else. As excited as I am for my budding foodie, I really have to up my game- baby food just won’t cut it for this boy. He’s made it clear he likes adult food more than anything else, so I’ve been making an effort to cook a big dinner most nights that he can also eat. The meals I cook need to be: Quick, Easy to prep ahead of time, and great leftover, (as Hugo usually eats our dinner for meals the following day.) I’ve gathered quite a collection of awesome recipes and I’m excited to start sharing with you guys! Because really- who doesn’t love quick and easy? This meal is also super adaptable, making it pretty simple to whip up with whatever you have in your fridge. I’ve made this 3 times in the last month and it’s always a little different. This version uses ground beef, but it’s also wonderful with ground turkey or even all beans. I’ve made it with greek yogurt instead of sour cream, fresh tomatoes instead of canned, and extra garlic instead of onion. This meal can handle all the changes and really just turn out so well. It’s basically onions and peppers sautéed with beans, ground beef and lots of taco seasoning. To that mix goes some rice (or quinoa!) tomatoes, and sour cream. The creamy mixture is then topped with cheese and jalapeño peppers, and baked for a few minutes to melt the cheese and finish the dish. It’s really that simple! Delicious, hearty, family-friendly dinner on the table in 30 minutes or less. In a large cast iron skillet, heat 2 tablespoons of olive oil over medium-high heat. Sauté the onion and pepper until soft. Add the beef and break apart with a spoon, stirring until browned and cooked through. Add the taco seasoning and stir well to combine. Add the beans, rice, and tomatoes, and cook for 5 minutes, stirring occasionally. Season with salt & pepper to taste. 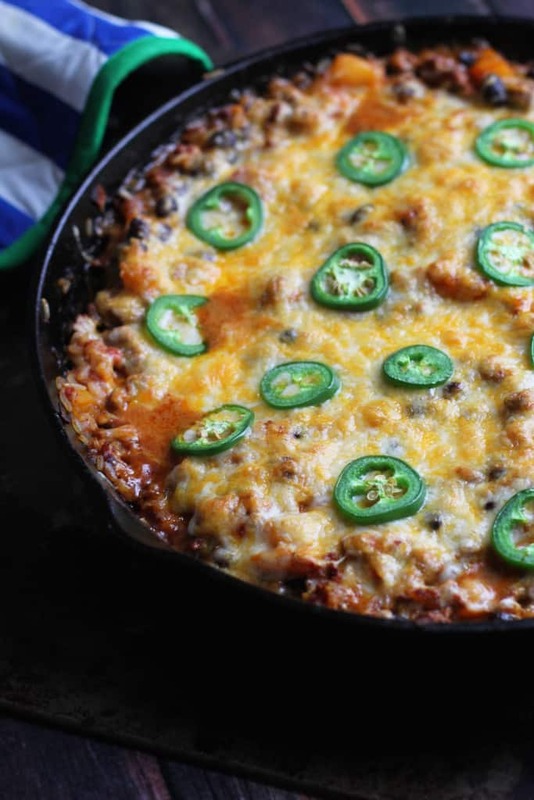 Stir in the sour cream and top with the grated cheese and jalapeños. Bake for 10-12 minutes, or until the cheese is melted and golden. Serve with a squeeze of lime and some tortilla chips on the side. Of course I love this series, I’m always looking for new dinner ideas and the more they’re simple and quick to put together the better! I love how adaptable this dish is! I’ll be trying it with greek yogurt instead of sour cream and with all beans for a veggie based dinner. I love this! It’s just the two of us, so I don’t make many desserts (truly, we don’t need them if we care to fit in our clothes by April) and quick and easy is the name of the game. I just printed this off for one of our dinners next week. 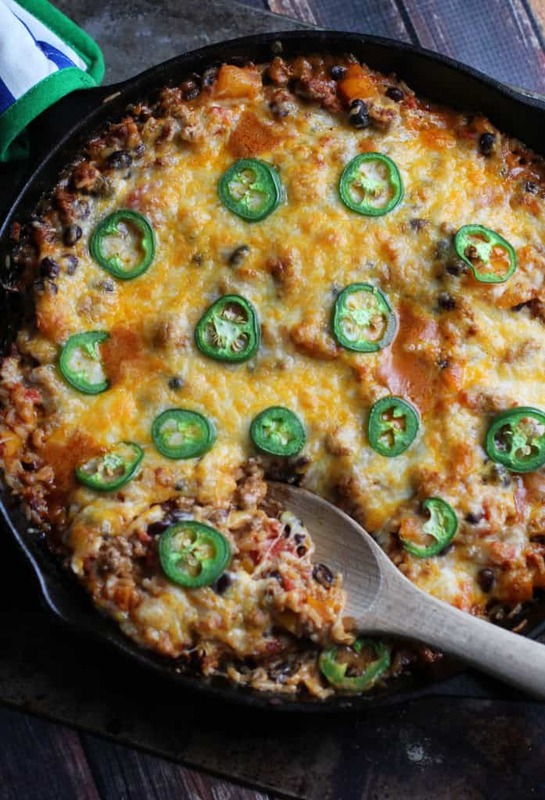 I’m really sad I don’t have a cast iron skillet…I want this right now! Guess I need to go shopping this weekend :) Pinned this recipe! This is such a great idea, Audra! We are all busy it seems, so the only way to go is quick and easy. I can’t wait to make this next week – my husband will love it. It will be so simple to put together after work and then have as left overs another night. My step-daughter has a little boy just a month older than Hugo. He has always preferred “real” food over baby food. He eats anything and everything. Sounds like a trend with these boys – baby food companies beware :) . I will have to share your recipe with her. I will look forward to more like this in the future! This looks great! I live in Tucson, AZ and have great Mexican food all the time. I would leave out the rice and use to make tostadas! meal series?! YES PLEASE DO! Yes, this is a great meal series! Going to try this one for sure! Pinning! My boy, like yours, always preferred “grown up food,” even as a wee one. Now he is a 29-year old innkeeper and chef. I can’t wait to try this recipe with him. It looks totally yummy! Daisy has been asking for tacos. Now that she’s over cheeseburgers, tacos are her fav food. Could you make this in a crock pot I wonder?